Yesterday, my wife was kind enough to let me go visit the local card show. And by local, I mean 24 miles away in Orland Park. The thing about that card show: after I leave I MUST go to Winston's Market for a few loaves of Irish soda bread. Now, you may have eaten Irish soda bread in your life, but until you eat Winston's, you haven't eaten the best. Well, it was snowing yesterday (shocking) and getting out of Winston's heading west can be a chore (159th is a bear to cross midday on a Saturday), so I headed east, jumped on Harlem going south and got on I-80. About 5 miles up the road, the brake lights started. Then we stopped. For almost an hour. When we finally moved, it was a car vs. van vs. semi we got to look at as we slowly drove by. The car lost big time. Sitting there, I got to enjoy my spoils in a relaxed, comfortable seat. 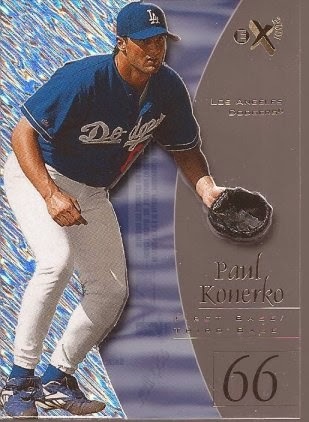 I was going to live tweet a few cards, but the snow made my phone's net connection really unreliable. It appears only one made it out. So you will have to just view the rest here. First stop was my 1964 vintage guy. Technically, he was stop two, but more on that later. 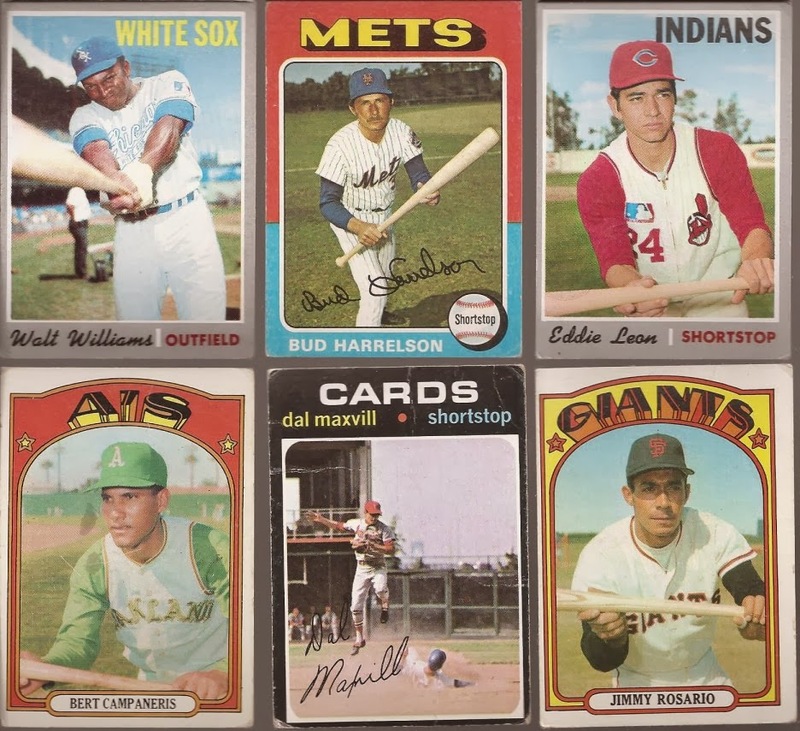 I dig through his usual 3 for a buck box and pulled out $6.33 worth of '64s for my set. I think I am getting to the point of needing to make a want list so I don't pick up doubles. That Choo Choo is a bit miscut, but it stays in the '64 stack until I find one that is better centered. Then into the miscut binder it goes. 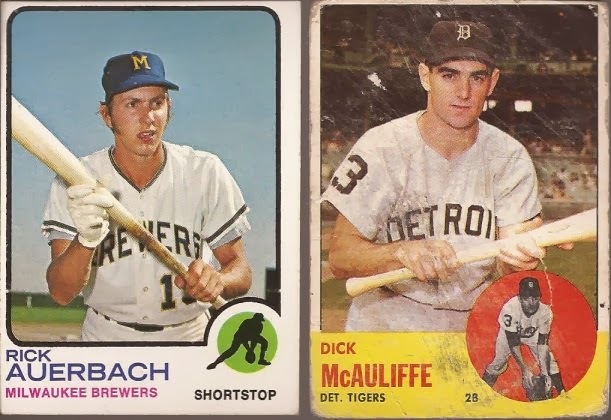 I said $6.33 worth of 1964 Topps because these two took up the other .67 cents worth of the $7 I dropped at his tables. Two for the bunting binder. That McAuliffe is a bit beat up, but I'll take it. Next stop, my dime box guy. He cracks a lot of wax, so you can easily set build with him. The only issue is that all the commons by set are not together - you have to dig through a few boxes to find them all. But he has a good ten 5000 count boxes for a dime a card, so it's worth it. Got some nice throwback binder additions. 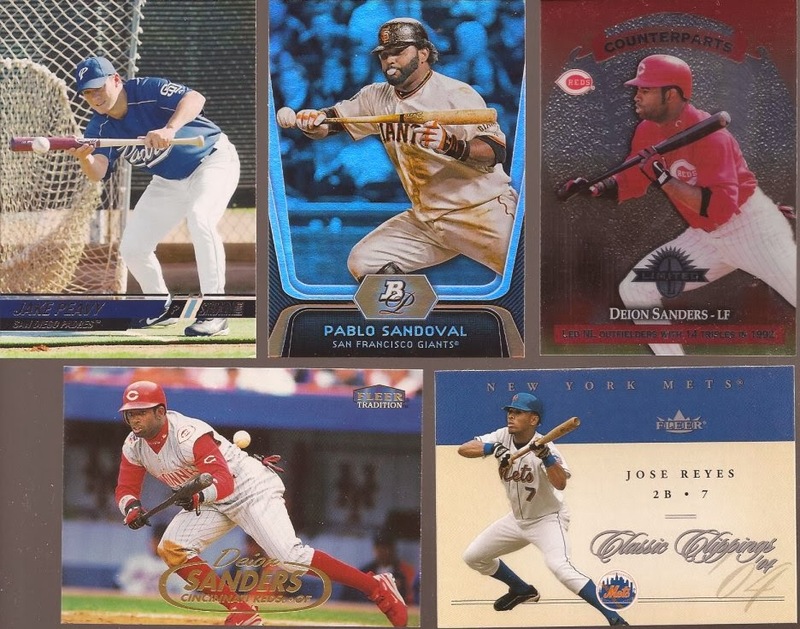 That Pujols is a 3rd year card - go figure. 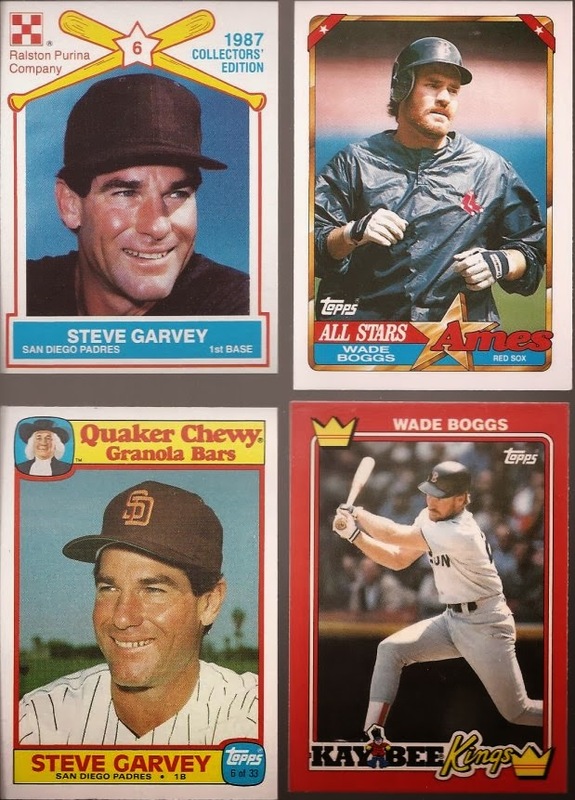 I think I will need to add pages to the bunting binder with all the pickups yesterday. Yes, Nick, not only is that a pitcher at the plate, but also a batting cage shot. If there were two of them, I would have picked you up one to go with all the other stuff I found for you. Sorry. I always love seeing the huge players laying one down like Sandoval. All total, I picked up 52 cards from him for $5. There was a new guy there I had never seen (or noticed) before. I gave his boxes a look through, and I wish I picked up the above cards for a 10 each. However, I actually paid a nickel for each one. Yup - this seller had 3 boxes of nickel cards. And the quality? He is my new favorite vendor. 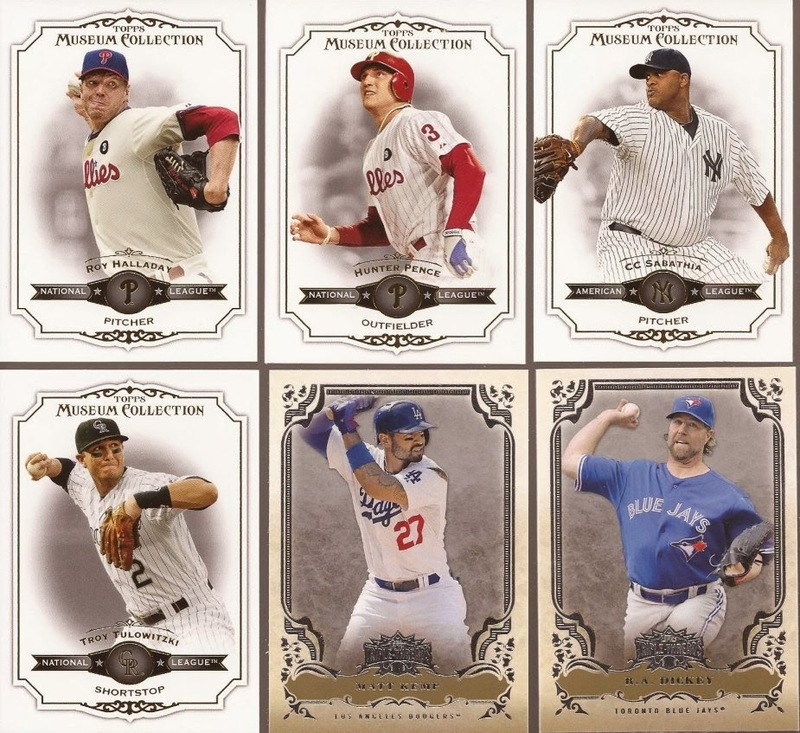 Museum and Triple Threads? Nickels. Vintage? Nickels. Hell - I bought a buck thirty five worth of vintage from him (27 cards if you don't want to do the math). Hostess? Yup - still nickels. Even oddballs for a nickel. Total of $5 worth of cards from him at a nickel a piece. The same seller had a quarter box with some nice items in it as well. I guess the star value of the Kellogg card made it a silver Washington each. And I couldn't pass on a Kell Tribute for a quarter. However, the find of the box came from the nickel purchase. Not a true rookie, but dang near close enough. 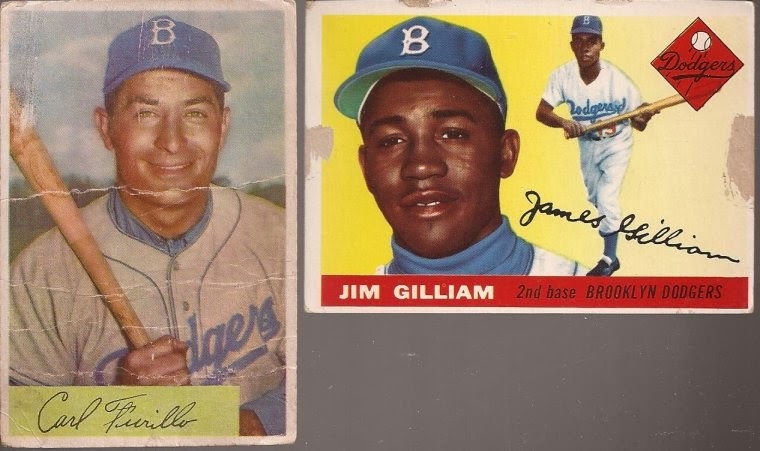 Only time will tell who ends up being the better player to wear 66 for the Dodgers. If you are doing the math, up to this point I have mentioned/shown $19 worth of purchases. I said earlier that I actually made one stop before my '64 vintage supplier. The last show I went, I talked about the super sweet ancient cards I picked up. Well, that vendor was there again, and I ended up making him the first and last purchases of my visit. For $6, here's what I grabbed. A buck each for these. Gilliam goes into the bunting binder. Furillo? I just couldn't pass it up for a dollar. These are the first purchases yesterday. 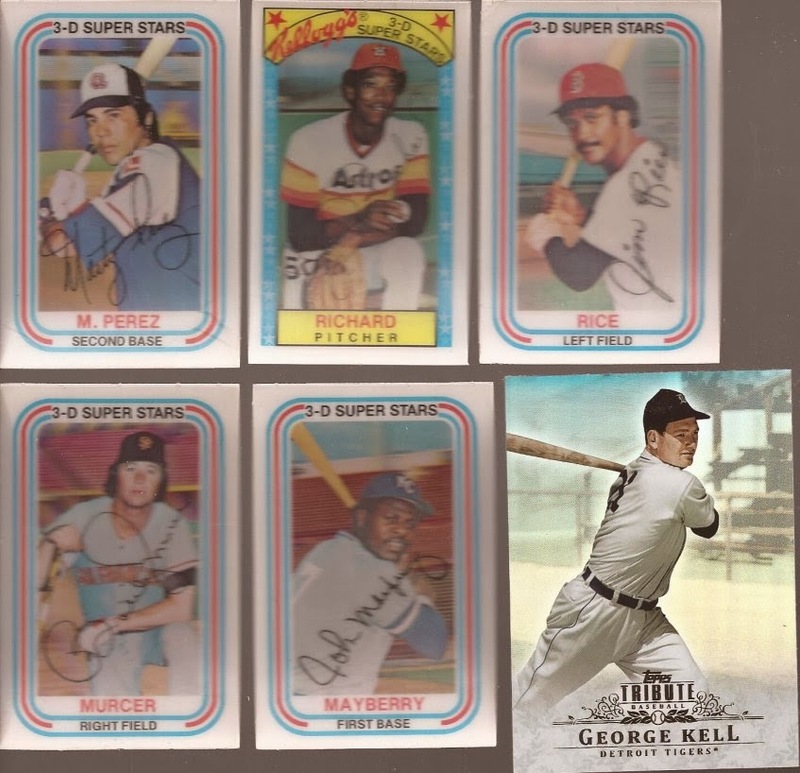 I kept going back to his table because he had a couple '54 Bowman Nellie Fox cards, needed for the new Fox Project. I just couldn't pull the trigger on either, and I bet I kick myself later. But I dropped $4 for the following cards as I headed for the door. I did tweet out that '39 PlayBall on the right of Demaree. I think, as a collector, you should grab at least one card from every set every produced. At least pre 1980. And I didn't have a PlayBall until now. 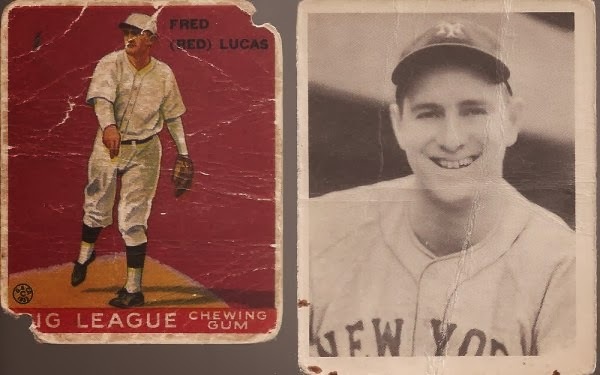 On the right, another loved 1933 Goudey. I do not get what the hole punches were in the corners. I guess you displayed your card however you could. Total spent: $25. Yet another perfect "blaster". Plus. I have 3 loaves of delicious Irish soda bread to eat. Well, 2.5 loaves now. My God! While looking at all those cards and the prices you paid for them I'm sorry, but I called you a bunch of names that I'm not proud of. I'm moving to the midwest. What do you pay for milk out there -- 3 cents? 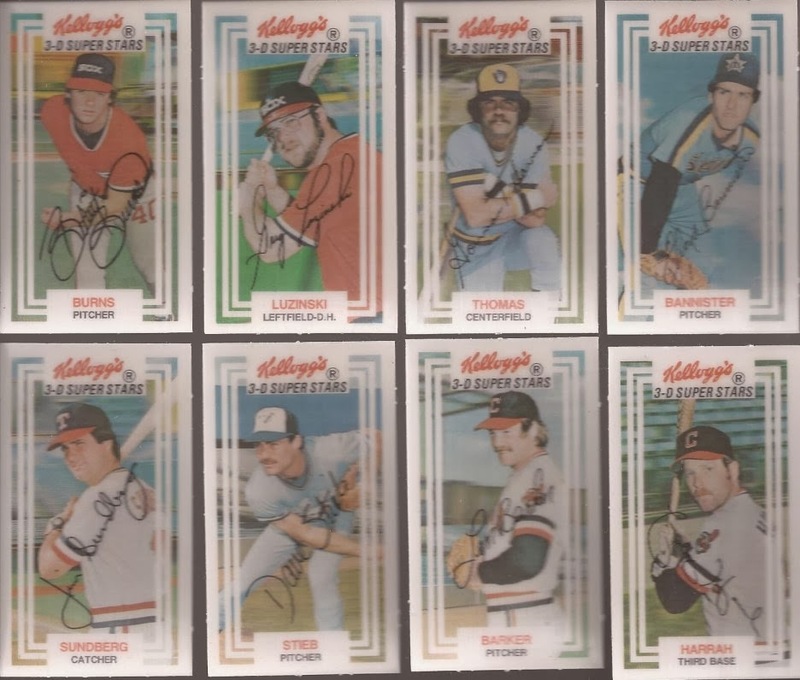 The Kellogg's cards, of course, are my favorites ... and the Furillo. I went to the Orland Park show a couple years ago and have been dying to go back ever since. I may have to set a little birthday money aside to make another trip up there after reading this post. I mean, Kellogg's AND Hostess for a nickel each? I'm there. Also, no worries on the Peavy. I already have one! That's a lot of cheap vintage. I googled, it's only an hour and 47 minute trip for me. Hmmm.